Don’t miss to visit in Thessaloniki Greece !!! Thessaloniki is the capital of the region of Macedonia, Greece. Hence, it used to be a stronghold and a transit point of many mighty empires. And, the city embraced their legacies, which make popular Salonika a very diverse destination. 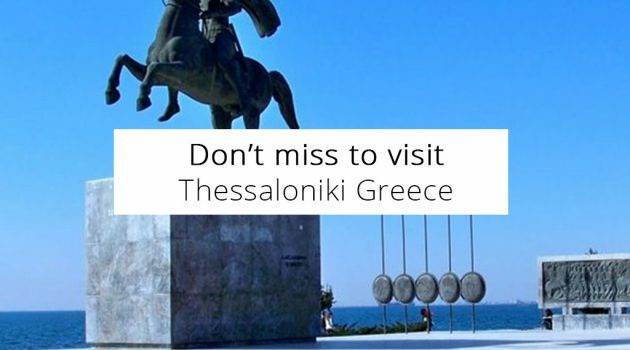 While sightseeing in Thessaloniki, people find historical remains and monuments at every step. Also, the city prides on several exceptional museums you should check out. The city of Thessaloniki used to be a significant Roman city. For having an insight into its status and glory back then, head to the Roman Forum archaeological site. Find the place in the city center and examine outlines of commercial and residential structures. Furthermore, visit the Roman Forum Museum, located within the complex. The adjacent Arch of Galerius conveys various achievements of this Roman emperor. Check out its marvelous reliefs. North of these sites, visit the Rotonda, which the great emperor probably intended to be his mausoleum. Byzantine churches are other great examples of the city’s significance. Many of them feature beautiful frescoes and mosaics. Also, a number have a UNESCO World Heritage status. While in Thessaloniki, pay attention to the Church of Agios Demetrios, Hagia Sofia and the Osios David. The last one is somewhat sidelined, but worth investing any time and effort. Additionally, visit the Vladaton Monastery nearby. You can examine medieval frescoes and enjoy views of the city from there. And, of course, take a walk along ramparts that protected Salonika in the past. The long Waterfront Promenade is the primary relaxing area here. There, breathe fresh sea air and visit the White Tower, the main tourist attraction in the city. The statue honoring Alexander the Great is near the tower. Also, visit a few of extraordinary museums nearby. Most noteworthy are the Archaeological Museum, Museum of Byzantine History and Art, and the Olympic Museum. By taking a short walk to north from the White Tower, you will arrive in Aristotelous Square. Enjoy a cup of coffee in some of its cafes. If you have more time, also visit the Ataturk Museum. It is in the house where the Turkish statesman was born. Finally, visit the Jewish Museum. There, discover how this community influenced arts and culture of Thessaloniki.